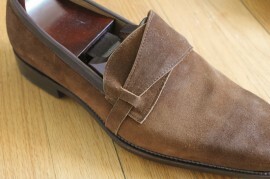 You may remember a while back Ed Et Al offered to treat me to a pair of custom butterfly loafers. Now, two months later, the finished shoes have arrived. I’ve unboxed them, given them the once over, and here are my thoughts. First things first. When I placed my order, I was told they would take about two months to complete, and Ed and Candy delivered on this promise almost down to the day. Candy was even kind enough to send some photos of the finished shoes along with the emailing notifying me they were on their way. Three days later I had the shoes in hand. Pulling them out of the box was very exciting. This is my first custom footwear experience, so I was anxious to see how things turned out. And broadly speaking, I’m very happy with the results. Pulling them out of the box, the shape of the shoes is exactly what I had in mind. A long, chiseled shape that avoids being too pointy or square at the end. You can see the toe puff has a nice shape and good three-dimensionality to it. For me, these are the difficult-to-achieve hallmarks of a good chisel toe. These are custom fit as well as custom designed. You’ll remember I did tracings of my feet as well as describing fit issues to Ed and Candy via email. Overall the fit is very good. 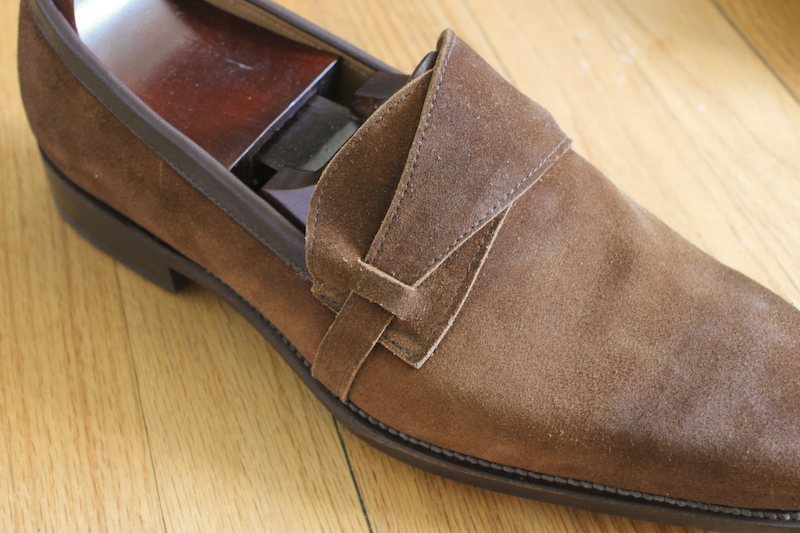 The toe box is comfortable but narrow and the waist hugs my feet nicely. My heel does pop a little, but I expect that to go away once I’ve broken in the soles. Considering this was all done between Singapore and Chicago via email, I have nothing to complain about here. Material wise, I’ve pretty impressed as well. 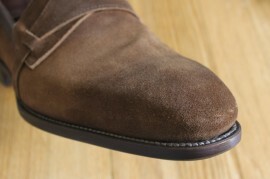 The suede is soft and richly colored, and the leather for the trim has good grain and structure to it. 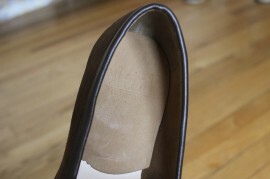 Construction feels sturdy, stitching is even and strong, and the heel is dense and well layered. 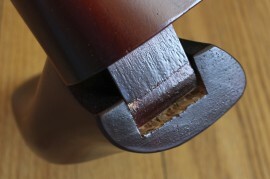 Some of the finishing details, however, leave a little to be desired. 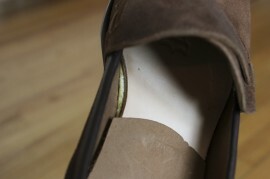 There is a little midsole peaking out from the edges of the insole and some glue visible in one of the shoes. 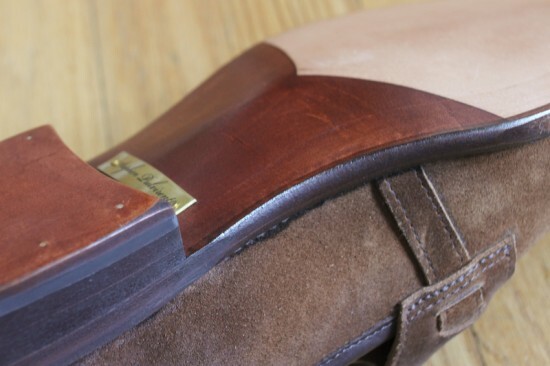 Obviously I’d like the attention to detail to extend to the insides of the shoes, but if there has to be some give-and-take, I’d rather it give here than somewhere more visible. 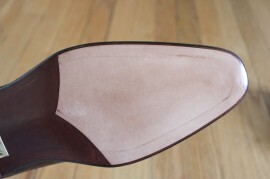 There is also some color variation on the toes and around the heels. I believe this is burnishing like on the leather shoe which inspired this one, which I did not ask for, but it could also be discoloration because of quick stretching around the last. Either way, it’s not optimal, but doesn’t really take away either. Moving back to the positives, the edges of the sole are beveled nicely, and the butterfly straps, welting, and sole finishing are all excellent. The complete opposite of the problems noted above. 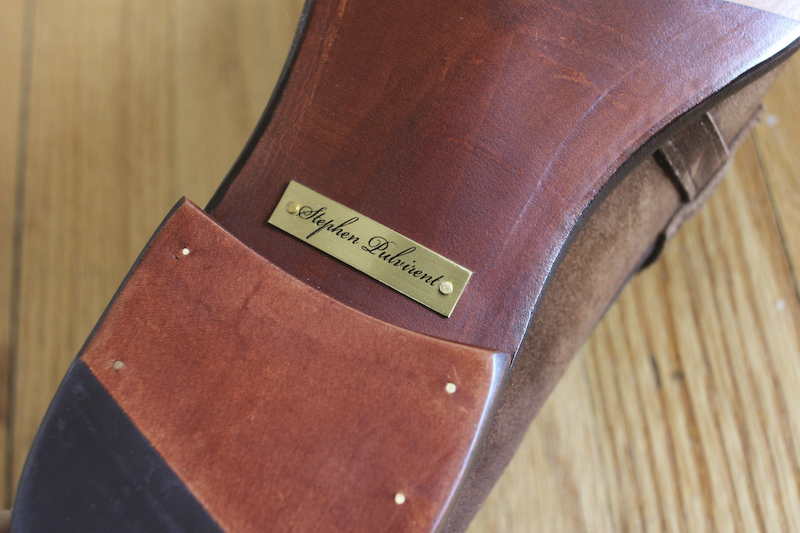 I had not requested the name plate on the fiddleback waists (option was never discussed), and I’m not one for bold monogramming, but these are pretty discrete and a nice little touch. Ed Et Al’s fiddleback waist is much more restrained and gentle than what I was expecting, but they hug my foot well without looking exaggerated in any way. If you’re looking for the super sharp fiddleback of Gaziano & Girling, this might not do it for you, but I’m very happy with the result. The only thing that I find frustrating are the shoe trees that come with the Ed Et Al custom grades. 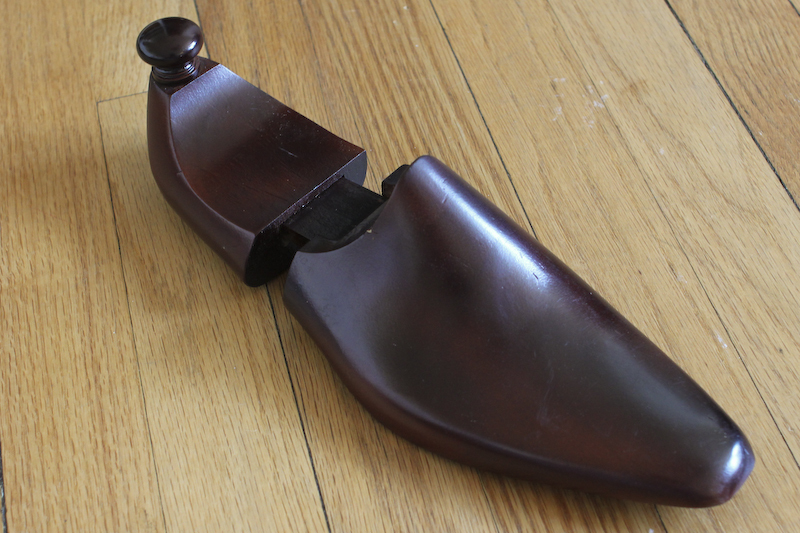 At this level of shoemaking (and price), I expect some cedar or hardwood trees that fit the shoes well – or no trees at all. 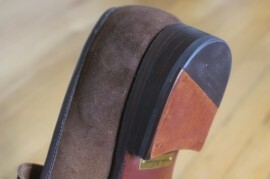 My foot is a little narrow, and while the shoes accommodate this the trees do not. The result is a tree that you really have to jam in there and I’m worried they might stretch the vamp out over time – plus they’re made of some lightweight particle wood with a veneer. Easy fix for Ed Et Al, and one I highly recommend. 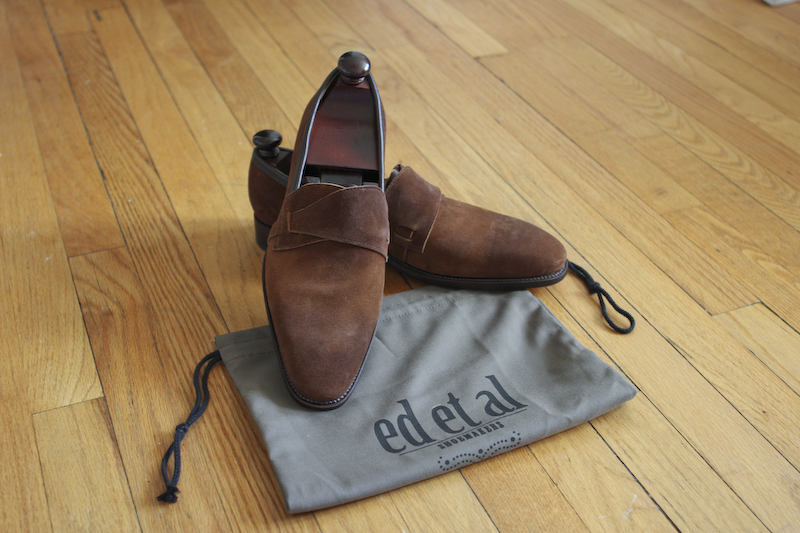 So, in summary, there is a lot to recommend about Ed Et Al’s custom grade shoes. 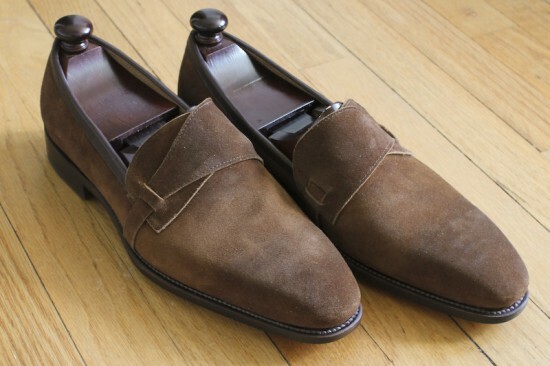 Starting at just under $500 USD, they’re definitely the most budget-friendly option for custom footwear. Ed and his team were wonderful to work with, accommodating, and generally responsive to my emails (though I know some readers have had issues with this). The raw materials are top notch, exterior finishing very good, and construction solid. I do wish interior finishing received a little more attention, trees were higher quality, and that I had been consulted on little details like burnishing and the nameplate. I think Ed has something very special here, and while he has a little room to grow and perfect, don’t we all. He’s offering a great service at a competitive price. 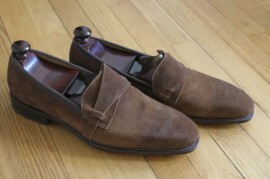 I look forward to wearing these and reporting back with final thoughts in a few weeks’ time. Update – After only a few hours’ wear, the heel popping is already all but gone. Like I expected, it was just a matter of breaking in the soles and not a problem with shape. The burnishing on the toe and lack of attention to detail on the inside is not very great but the overall shape looks awesome. If they could fix those two things I think they’d have something on their hands. I agree. The burnishing doesn’t look nearly as pronounced in person as it does in pictures, but it’s still noticeable. With a few little improvements, Ed Et Al could become one of the best new brands in the game. I have been rather impressed by his RTW range. More time was needed for this shoe. To be frank, you should have lived round the corner.